Don’t leave your guests in the gutter! 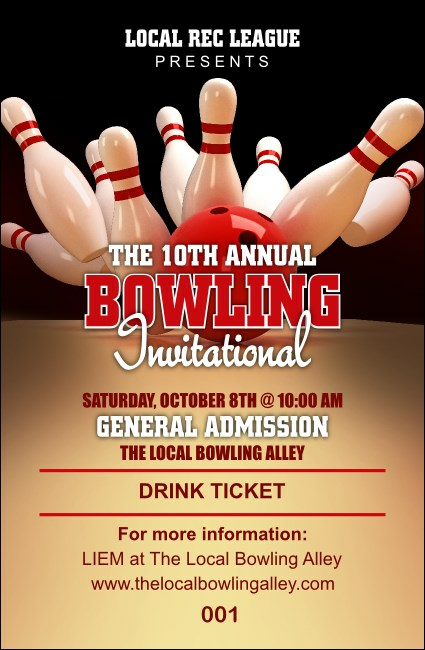 Make sure they feel warm and welcome when you give them Bowling League Drink Tickets for your sporting event. With the exciting image of a shiny red bowling ball knocking down a line of pins, and twelve lines of text for your event details, these ticket templates will help you score some major points. TicketPrinting.com helps you roll with the right crew!